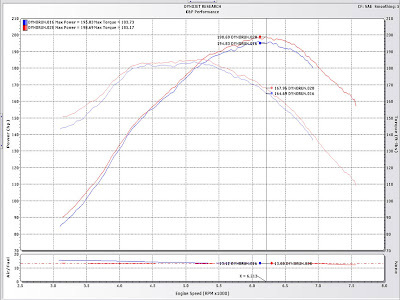 As you can see the gains are about 3-4whp through the entire curve, more down low where the stock ecu runs pretty lean and a bigger gain up top. Also the ability to rev about 500rpms higher is nice, I’ll be able to wind my shifts out a little more for better before/after shift power matching. The results were replicated within ~1whp with three back to back pulls on MS. I didn’t have enough time on the dyno to let the car cool down to the levels at the beginning of tuning, but the results might have been just a touch higher. You can have better then a chip tune, even a ‘really good’ one. Stay KPTuned for track results shortly! This entry was posted on Tuesday, March 31st, 2009 at 4:12 am and is filed under General, MegaSquirt, Tuning. You can follow any responses to this entry through the RSS 2.0 feed. Responses are currently closed, but you can trackback from your own site.